Moose Tracks - What do Tracks From A Moose Look Like? You can learn a lot from Moose Tracks in the ground. 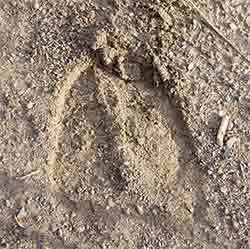 Moose tracks are easily identifiable by their shape and size. Moose are the largest living member of the deer family (Cervidae) and fittingly bear the largest set of feet. The moose is a large and heavy animal and therefore the track from a moose is easily found and identified. Tracks can be found anywhere in good moose habitat. Moose habitat consists of forests and meadows and often the ground is soft. Moose need those big feet to distribute their weight so they do not sink. As a moose stands on hard ground the hoofs stay together but when he stands on soft ground the hooves spread out... acting almost like a snowshoe would for you or me. The long narrow shape of this track, unmistakably a moose track. 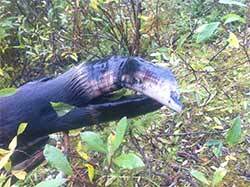 Not more than 24 hours old, this track from a moose is a good indicator that there is a good sized moose in the area. We can judge the age of this track by studying its characteristics; note what the surrounding ground texture looks like then have a close look at the track itself. Do you see the difference? The track maintains a fluffy texture in its main section; the edges are clear and crisp. If I were able to touch this track and show you, you would see the center of the track is soft as, as though the soil had just been disturbed. Compare this to a beef cow track you can see the difference. The beef track is much shorter and more rounded at the toe. Here is an old Beef Cow Track preserved in dried mud, much shorter and rounded than that of a Moose. A good way to tell if a track is very fresh is to step (soft ground) or kick (hard ground) the soil beside a track and make your own. Then, get down on your knees and take a close look. Compare them in detail: look at the moisture content (does your track appear to contain more moisture? ), do the edges of the track appear crisp and clear? Touch the soil with your fingers, are they compressed similarly? If the weather is freezing, frost will begin to lift portions of the track. The same scenario goes for tracks in the snow, only here the tracks will age much quicker. In soft dry snow the edges will begin breaking down immediately (in fact it may be impossible to determine freshness), look for fresh droppings or bedding places instead. 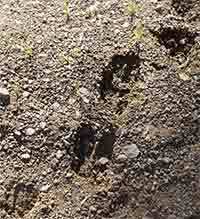 A moose track from adult moose typically will measure 5-7 inches (13-18 cm) in length. Depending on the type of ground he walks on it may not be possible to get an accurate measurement from the track from a moose, but on hard ground this is what you will find..
You get a clear idea of how large these tracks are when set beside a human shoe. This size 10 hiking boot pictured beside a moose track shows a good comparison. The top print from this moose track is from the left rear foot. In most cases the rear foot follows slightly behind, but as you see the toe of the rear foot overlaps the front track. This Size 10 Hiking boot shown for comparison beside a moose track. This is not a fresh track, the sides of the track have dried and are hard. Made while the ground was soft from the last rain, this set would be too old to try and track. This particular track is about 72 hours old... I know this because the track is over top of my ATV tire tracks. There are many theory's as to what a bull track looks like compared to a cow moose, the truth is: there is not definitive answer. There is however some guidance. A bull will be heavier than a cow, therefore the impression would be deeper. The problem is; deeper than what? Some have said you can tell the difference in the way the moose urinates or how the urine puddle is formed. My biologists friends say this isn't so either. Then there is the question of the dew claw impression. In soft ground a cow leaves those too. 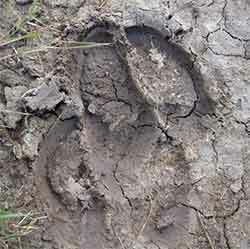 I look for large track impressions when I'm looking for bulls. They should be fairly recognizable: wide, long and deep. Unfortunately, there isn't a sure fired way to know! Moose calves on the other hand are quite a bit smaller. When moose calf tracks are viewed beside a cow moose track it is easy to see that a calf is a much smaller animal than its mother. Calf moose tracks following in its mothers footsteps. Again, not a new set of tracks – they are disintegrating and crumbling. 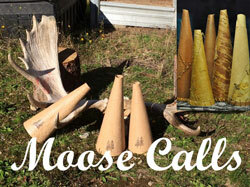 Here is an example of the power of those moose hooves. I recently heard a story from the early days in British Columbia (I think it was in the early 1950’s) when it was decided by the wildlife managers to transplant some moose. The setting as I was told was in the Caribou region during the winter when the moose were concentrated on the wintering grounds. A large coral was built with a funnel of sorts to direct moose in. Men on horseback herded the moose into the coral and the gate was closed. Now this coral was built strong and high to contain these wild animals until transportation day. The coral was built of 4-5 inch(10-13cm) diameter logs, stacked horizontally with very little space between each log. A wildlife manager approached the outside of the fence to get a closer look at these captive moose... he got his look alright, he was lucky he was uninjured. As it happened there was a moose close to the fence when the man approached. The moose being agitated and of course because it is a wild animal did what came natural when something strange approaches. The moose kicked out, and the foot broke a log and his leg came right through that fence. Fortunately the man was just left or right and managed to escape the kick. That's pretty impressive. An animal being able to break a 4-5 inch log with one kick. It's no wonder a moose can run through such demanding territory seemingly without effort. It gives a person a whole new respect for these majestic moose. If and when you are tracking moose I suggest you use a GPS to keep from getting lost. 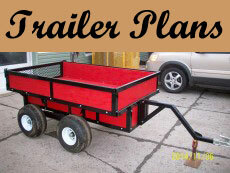 A GPS will track where you have been and guide you safely back to your vehicle. We have been using Garmin GPS's for well over 10 years now and I highly recommend them to you. Moose are wild animals and can be aggressive if threatened. Those hooves can be lethal weapons when used for self defense against predators. 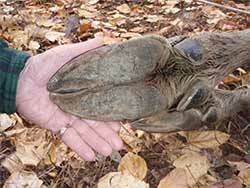 This is a bull moose hind foot. Compare the dew claw wear to that of the front foot. Those toes can and will spread out considerably to support the weight of the moose on soft ground. 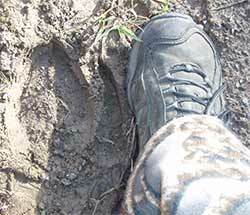 The shape of the foot are what you see as the track from a moose. This is a bull moose front hoof. Compare the dew claw to that of the hind leg. Not much wear to see here. These are only a small sample of the moose tracks you’ll find while in moose country. I encourage you to venture out and find your own. Sometimes you’ll be lucky enough to see the tracks being made. You know then that they are fresh moose tracks. 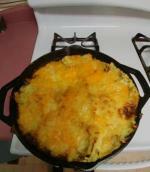 The photo above was submitted by a hunter from northern BC. 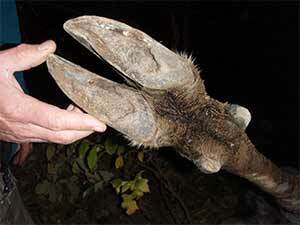 This is a bull moose rear hoof. It looks as though the foot or toe was injured when the animal was young. I have seen cattle with hooves that have grown grotesque like this but there are people in that field that can help the cows. They have special equipment and tools to trim hooves. Moose are not so lucky! This guys gait was probably limited and he would have found it difficult to fend off predators. It would have been cool to find a moose track made by this moose just to see the difference between a normal and a deformed hoof. If you have a question about moose tracks, or tracking moose or general moose questions please check the ask an expert webpage. You'll find answers or you can post a question; I’ll try to respond in a timely matter (it gives a chance for others with knowledge to respond as well). You can be assured that if you have a question, there are many others out there that want the same answers? There is no such thing as a dumb question. 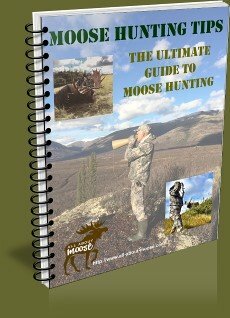 Are you looking for moose hunting tips? You will find them right here! 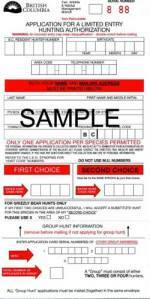 Read what others have said regarding moose hunting tips, read the submissions from others by clicking here.